Review: Broadway in Syracuse's performance of the Tony Award-winning musical delivers a brilliant and fun performance for all ages. Even those who have never seen or read The Wizard of Oz have at least heard of it, and if you have even the slightest interest in theater then you have most likely heard of Wicked as well. Famous Artists Broadway Theater Series' Broadway in Syracuse program has brought the Tony Award-winning musical to Syracuse’s historical Landmark Theatre and it’s a performance that shouldn’t be missed. "I finally understand why I have friends who have seen variations of this production more than five times. It really is that good." For those of you who have never seen Wicked, like myself prior to this performance, it is a look at what happened in Oz from a different point of view. The story gives the audience a whole new perspective on the witches of Oz and on what we perceive as good and well… wicked. In this sweet story about love, friendship and the troubles of being misunderstood, the viewer ends up falling in love with the so called “villain” just like the way we sympathized with Maleficent in Disney’s 2014 Sleeping Beauty adaptation. Before Dorothy and Toto arrived in Oz, a young girl was born with emerald-green skin, and despite peoples' fear and judgment of her, she was smart, caring, and extremely talented. When she becomes roommates at school with a pretty and popular blonde, they initially clash, but eventually the rivalry turns into a true friendship. From singing to staging, everything about the performance is magical. In the very first scene as Glinda (Ginna Claire Mason) enters on a flying, bubble-blowing contraption with munchkins dancing beneath her, the stage has already taken viewers into another world. However, the true delight takes place every time Vosk and Mason go onstage together. The chemistry between them, no matter what ups and downs they face, really relays the importance of friendship and the message of females lifting each other up and supporting each other in a world that makes it so easy for us to tear each other down. As seemingly flawless as the performers were, the show truly came to life through the amazing staging and costumes. Glinda’s bubbly personality and confidence are reflected in glitzy, sparkling gowns in beautiful shades of blue, pink and yellow. 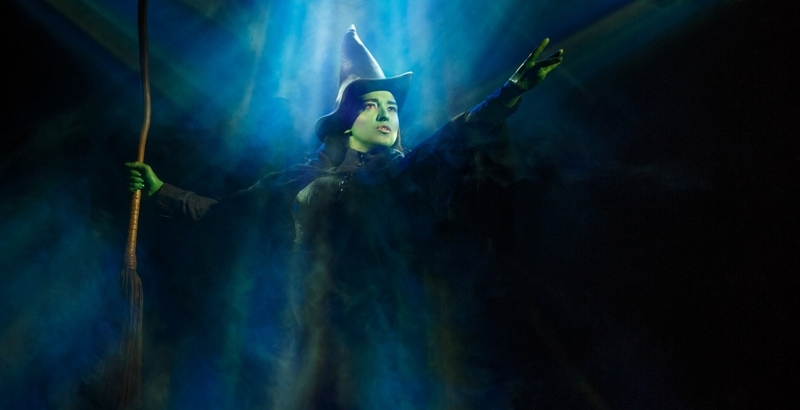 Elphaba is usually dressed in more conservative frocks and uniforms in muted tones, which display her seriousness and more reserved personality. Even the costuming of the flying monkeys and other animals, such as Dr. Dillamond, are so eccentric and fun. The stage produces just about everything you could imagine in the Land of Oz. There is a glowing Emerald City, a dark foggy forest and drastically changing weather. The characters fly around with ease and the platform is never dull or simple. This is the type of show that can be enjoyed by community members of all ages and I finally understand why I have friends who have seen variations of this production more than five times. It really is that good. Tickets are available now through March 26.